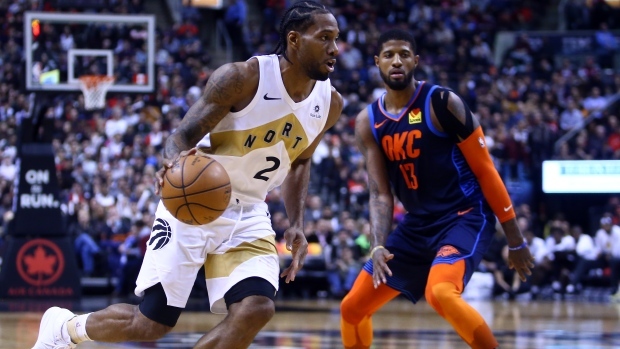 Leonard on health as playoffs near: "I'm feeling good"
Toronto Raptors star forward Kawhi Leonard talked about his health after the team’s 116-109 loss to the Oklahoma City Thunder Friday, saying he’s feeling good as the playoffs draw closer. Leonard logged more than 35 minutes on the court and scored a game-high 37 points in the Raptors’ loss Friday, just two days after playing 42 minutes and scoring 22 points in an overtime win over the Thunder. Leonard also touched on his load management throughout the season, the biggest factor in the 27-year-old missing 20 of the team’s 73 games so far this regular season. “Missing games isn't just to keep me fresh. It's making sure I don't re-injure something that I was out for last year. They've been doing a good job of reading images and making sure that I'm improving instead of declining on the health side." Leonard leads the Raptors and is averaging a career-high 27.2 points per game to go along with 7.4 rebounds per game, also a career-high. In his first season with Toronto Leonard said his relationship with the team’s medical staff is important. "It's big. You've got to be able to play for people you trust and them be able to see what you feel. And you just go from there and try to get better together."